Yes. Yes we did. 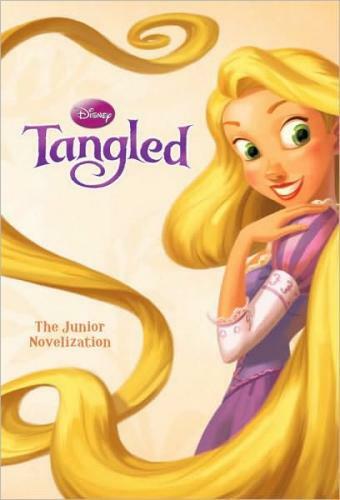 I found Tangled: The Junior Novelization at Goodwill "on the cheap" and I did indeed buy it. Why? Because it's a great piece of literature? Because it will sharpen and hone my children's worldview? Because it would provoke intelligent conversation between us? I bought it because I knew my kids would love reading it and it would be an enjoyable experience. And they did. And it was! On the heels of reading The Strictest School in the World (linked) I wanted to lighten the reading mood and give them something that they could easily digest and would offer no complaints about. This book fit the bill. My kids are big fans of the movie Tangled and, I confess, so am I. (It might have surpassed my love of Beauty and the Beast which has been my long-standing favorite.) Who can resist this memorable cast of characters, the witty dialogue, Maximus acting like a dog, frying pans, or Pascal pounding his little chameleon fist. It's just an awesome movie with really fun songs as well. Our whole family loves watching this movie and so I didn't hesitate to buy the Jr. Novelization. Sometimes you just read for the pure pleasure and fun of it and that's exactly what this was. My kids loved it. I loved it. We read it in two days flat. (We would have read it in one had my reading voice held.) Both of my boys - even my three year old! - would beg me to "read another one!" and we plowed through the chapters at a dizzying pace. Being that it is a novelization, it follows the movie to the letter. (Except I'm guessing that they cut a shot or two from the film as there was one scene in particular that was in this book but not in the movie. Pity the cut too, because I can see the scene in my mind's eye and it would have been hilarious.) Bookworm1 was especially riveted to the book to the extent that if his brother so much as knocked him, Bookworm1 would tell him to stop distracting him from the story. Bookworm2 isn't that big on chapter books but he sat at my side for chapter after chapter, laughing and talking about the story. This is especially remarkable as there are not many pictures included. The pictures which do exist, are tucked neatly in the middle of the book instead of being spread throughout. Best still, Bookworm three even paid attention, laughing every time I read, "Rapunzel! Let down your hair!" in the same manner as Mother Gothel. I like stretching my kids in their reading experiences and introducing them to stories that I love. But I also like sitting back and relaxing with them. We made a day out of reading this book together, pausing periodically to give me a reading break. We ate cookies, stayed in our pjs and just enjoyed reading a story that we all get a kick out of. If you haven't seen the movie, I highly recommend it. If you really like the movie (and your kids do as well) then you might find this junior novelization kinda fun. I was impressed by how well the story was told. The vocabulary is stretching and more than once I was pleased by descriptions of Rapunzel and Flynn Rider's antics. It's just fun, ok? I'll keep this one around. Something tells me I'll be asked to read it again some day. I won't object! Linking this up to Read Aloud Thursday over at Hope is the Word! We all like that movie, too. I wouldn't be opposed to the book! Interesting that you should mention this one and Beauty and the Beast. As much as I love the music from that one - and Angela Lansbury - I think the plot is disturbing. (This is the fault of the original tale, of course.) I can't remember exactly where, but I heard someone say that the antidote for this tale is Bluebeard, and I might agree. I really enjoyed Tangled, though. I wasn't quite as concerned about the idea of "rebelling" against a parent as you were though. In context, the "mother" is abusive. One ought to "rebel" against evil, in my opinion, even if it comes from an authority figure. We LOVE Tangled! It's a favorite here in our house. We talk about how the evil lady is NOT the mother because she does not have a mother's love, we call her the evil kidnapper. If I saw this book I would buy it! Thanks for the review! Sounds like a winner! We love the film -- the only objection is what you mentioned in the movie review, when Flynn tells Rapunzel that you have to rebel a little to grow up. I don't think I would have caught that if I hadn't read modern "wisdom" saying the same thing. It's "expected" these days that teens will be rebellious, but one can grow into independence without rebelling. I often find myself choosing an easier book as a read-aloud after a challenging one, too. :-). My girls have this movie and have watched it several times, but I confess to only giving it half my attention any time I've been present with them. From the sounds of things, I need to pay attention next time! We've never seen the movie, so I'll look into it. Could you please reply back to me if you think there's anything scary in it? Nathan is very sensitive when it comes to peril or scary characters in movies. Thanks! Tangled is definitely one of the better moves to come out of Disney is recent years!! I agree with the discussion on rebellion. I also like that the princess and her "prince" actually need each other. It's not as heavy on the "Girl Power" that Disney likes to weave through their princess tales these days.